Due to the luxury nature of our Platinum Safari, we seem to attract the attention of celebrities, sports personalities, high profile corporate clients and the occasional Billionaire or two. Below, in no particular order, we have compiled a list of some of the most opulent activities we have put together for our more discerning clientele. 1) Ultimate Luxury Desert Safaris. You would think that a private Mercedes G-Wagon desert safari inside the property of a Royal Family member would be enough for most folks, well, not for some of our guests. Try helicopter transfers to avoid that 45 minute drive to/from the desert, Steinway Grand Piano’s with an Opera Singer on the top of a dune at sunset, Classical orchestra around our oasis lake during dinner and a choice of supercars for the return drive home from the desert. 2) Super-Yacht Cruise. 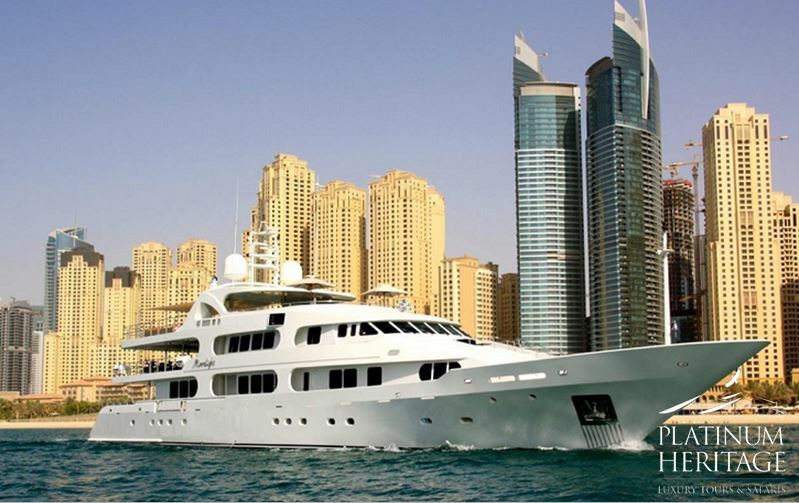 Fancy a view of Dubai from the sea, one of our guests was more than happy with a sail aboard the 118ft Moonlight superyacht, with reception areas, open dining rooms and enough cabins on-board for 18 of your closest friends to stay overnight. 3) Private air charters. Traffic can be such a bore. 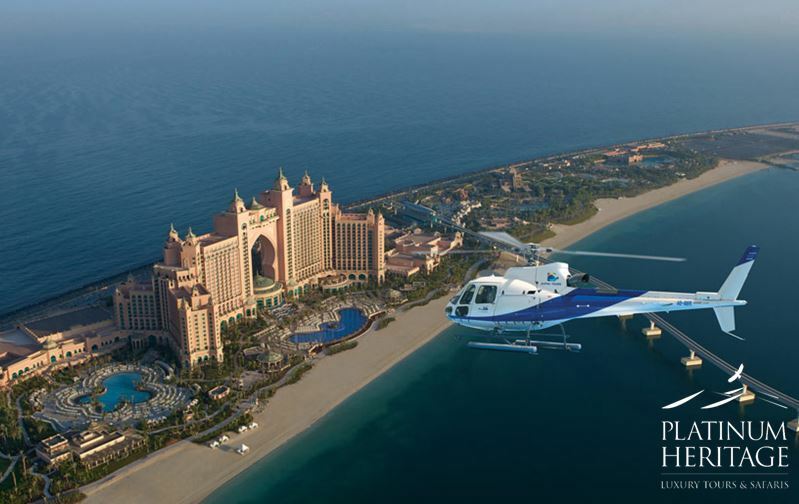 This is the opinion of many of our guests who prefer to fly from their hotel to the desert via the scenic highlights of Dubai on their private helicopter. Perhaps a Seaplane flight to the Yas Marina Circuit or to Sir Baniyas Island for a private game drive to view Giraffe and the Arabian Oryx rubbing shoulders is worth a try? As they say, the sky is the limit. 4) Opulent Overland Tour. 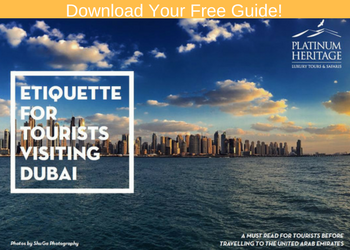 You want to get away from it all, see the highlights of the UAE and Oman but you still want the creature comforts of the world’s best hotels? Embark on a 4 day adventure across desert and mountains in one of our Mercedes G-Wagons. Hang your hat at the private reserve at the Six Senses Zighy Bay Resort in Northern Oman for a few nights. Located at the secluded end of the resort, on its own stretch of private beach, the suite has four bedrooms, a variety of separate living and dining room areas for entertaining, a private spa suite, a gym, a yoga studio, staff quarters, a 17-metre infinity swimming pool and live-in butler. While you are there, try scuba diving with giant sea turtles, paraglide off a mountain into a stunning bay or enjoy the sunset from a luxury dhow. The next day after a day of spotting wildlife in a private conservation reserve, watch the animals from the privacy of the Presidential Suite at the Al Maha Desert Resort, complete with three large bedrooms, each with a custom-made super king-size bed, handcrafted furnishings and an opulent bathroom. This is how the super-wealthy really enjoy getting away from it all. 5) Supercar tour. Nothing screams luxury like the burble from the exhaust of a supercar. 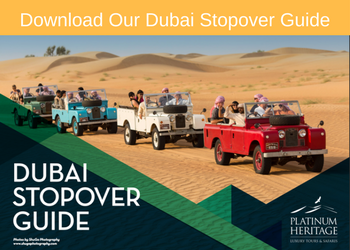 Discover the UAE’s most beautiful roads on a self-drive tour where you are the pilot of five of the world’s most exotic supercars. Try the amazing Lamborgini Avantador and compare this to the Ferrari 458 Spider. Perhaps the Mercedes SLS, the McLaren MP4-12C or the Lamborghini Gallado is more your style. Try them all in a 7 hour tour and then decide which one you want to buy when you return home from your vacation. 6) Romantic Hot-air balloon for two. 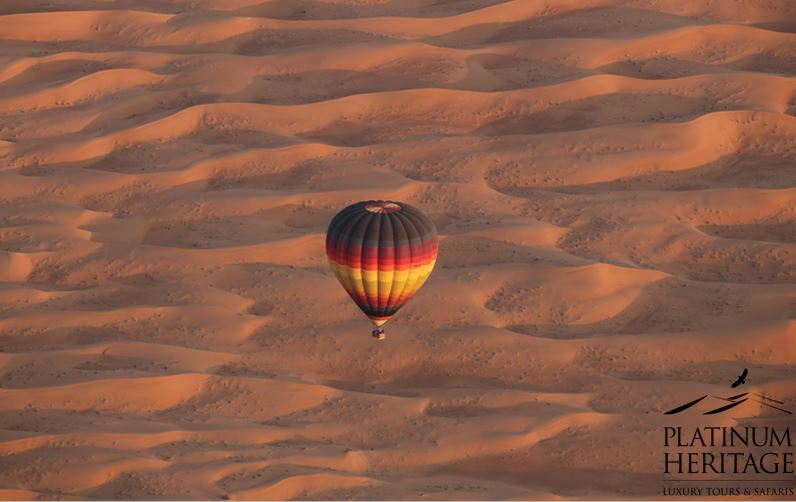 Glide over the majestic Dubai desert landscape with your soul mate on a private hot-air balloon for two. Upon arrival, our G-Wagon will collect you for a private, romantic breakfast in the desert. 7) Personal Fashion Advisors. Want the inside scoop on the latest releases this season? Nobody knows more and can guide you to your perfect new wardrobe than a personal fashion advisor. Experienced with what suits different body styles and budgets, these personal shoppers even have the industry connections to close the most luxurious fashion boutiques for private fittings. 8) Private Stable visit. 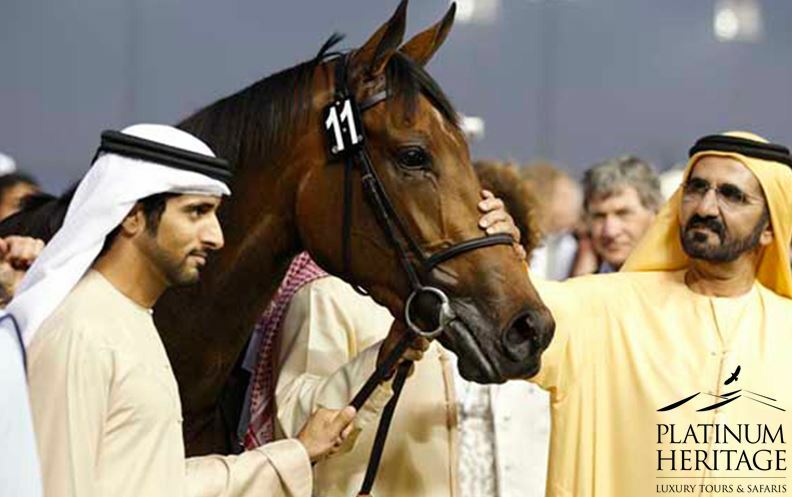 With prize money of US$10 million, it is no wonder that Dubai is home to some of the world’s finest racehorses thanks to the Dubai World Cup. A very select few can visit the private stables from a prominent Dubai family. The only catch, bring a sizable donation for a children’s charity if you want to make it past the front gate. 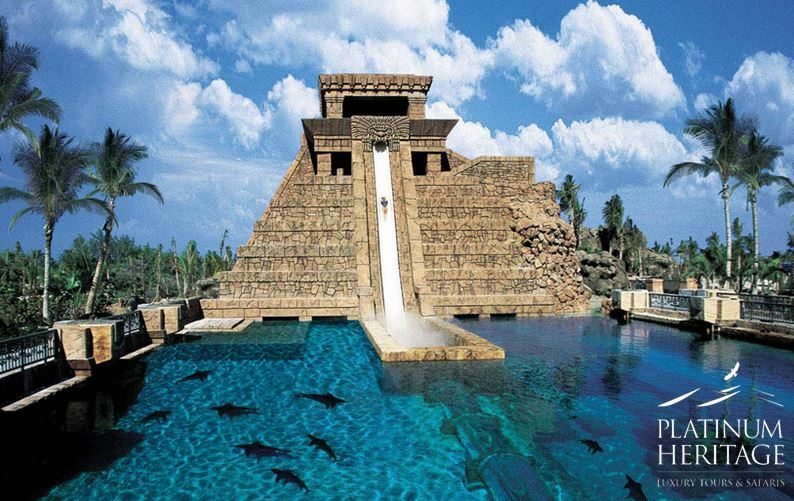 9) Ski Dubai, Aquaventure and At The Top – just for you! You love the action and adventure of some of Dubai’s most iconic attractions but you have a problem with crowded spaces? No problems, some of our guests simply book the whole facility for themselves and their friends. 10) Private Dinner on the Burj al Arab Helipad. 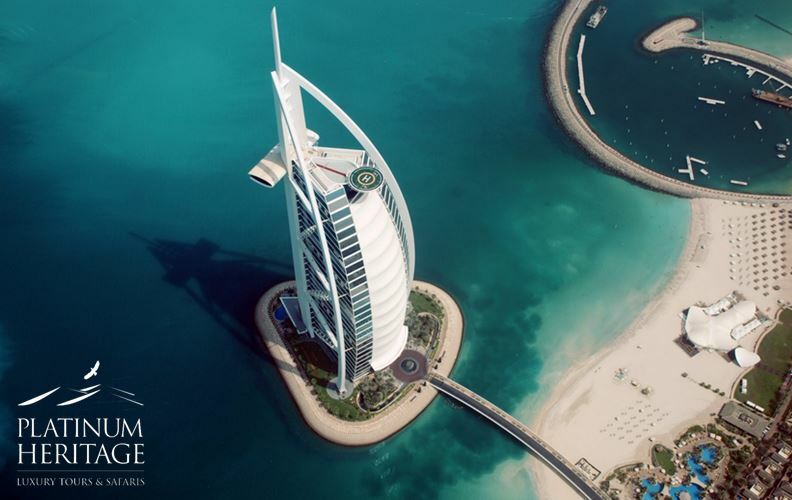 The Burj al Arab has become a symbol of Dubai’s innovation and creativity. Famous for an Agassi v’s Federer tennis match and a big Tiger Woods drive, there is nothing quite as exclusive as a private dinner on top of the Burj Al Arab Helipad. Also becoming popular for weddings, nothing can top this venue for bragging rights. If you are in the mood for something you will never see in a tourism brochure, contact Platinum Heritage and allow us to create a bespoke vacation to remember.